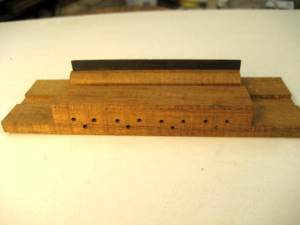 This type of bridge has several advantages over the standard single hole bridge. 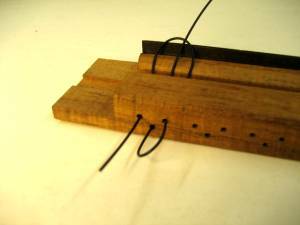 It can be used as a single, 2 hole, or 3 hole tie bridge and allows for increased action adjustment if the string height needs to be lowered. 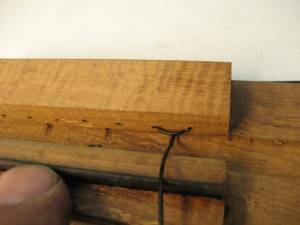 The 3 hole bridge can be tied using only the center hole in the normal fashion as done with a 1 hole bridge. Or, you can use all 3 holes, which I prefer. The 3 hole tie places more downward pressure on the saddle. The 3 hole method is shown below. 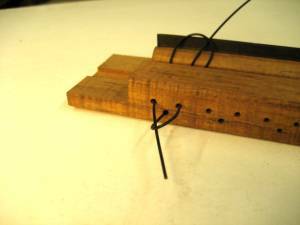 Start by pushing the string through the center hole from the front of the bridge. Push about 2cm of length through the hole. Experience will show you how much you need to push through. 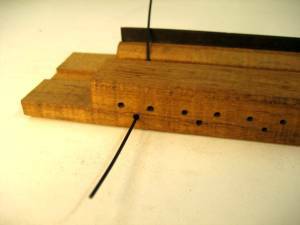 Looking from the back of the bridge, push the string end back through the right hand hole. Then bring the string back over the top of itself and push the string end again back through the left hand hole. 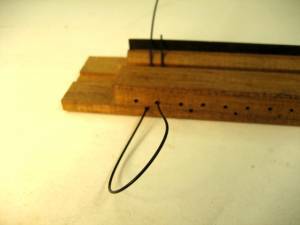 When the string end comes out the back of the bridge again, put it through the loop that was created in photo number 3 above.